We first began working with modern luxury wedding planner Cloud Creative Events a few years ago, the way we start working with many of our small business clients – on a single small project. She had created her own website, as many solopreneurs do, and got in touch with us for a little SEO treatment, which went really well. As Cloud Creative has grown, we’ve implemented several short rounds of website improvements over the years to expand on the site’s content and reflect their growing team and portfolio. In the last six months though, we’ve been working with Cloud Creative a lot more. Owner KC Cloud was ready to make some big moves, so in that time we have redesigned their logo, made several more website updates (especially to expand the portfolio and publicity pages), and we’ve also updated their pricing booklet and created new business cards for KC and her team – all without complicated and expensive design “packages” since we just track our time. We couldn’t be more proud – take a look! 1. Just because we’re “creative” doesn’t mean we aren’t professional. Not all creatives have blue hair and facial piercings (but to each their own) or sleep late and work all night. At Green Apple Lane, for instance, each of us offices from home, but we have dedicated real offices in our homes, and we manage our time really well. Potential clients sometimes ask, “What types of clients do you serve?” to which we proudly reply that we work with all types of clients from all types of industries: lawyers, healthcare professionals, car dealerships, luxury wedding planners, auto mechanics, cake bakeries, political campaigns, dairy farms, private schools, beauty products, professional photographers, art classes, funeral services, real estate, authors, and the list goes on. This has made us chameleons, or Janes-of-All-Trades, because we have to dive head-first into all of these fields, and we love it! And depending on the client, we’ve had meetings in board rooms, coffee houses, garages, or just over email and phone. We’ve met in flip flops and business suits. We’re in the business of whatever your business does, however you do it. 2. Tell us the issue, not what you think the solution should be. More often than not, the opinions of whether you, your spouse, your child, or even your designer PERSONALLY like a design are completely irrelevant, unless we are your ideal customer (and it’s highly unlikely that all of us are your customer, unless you’re in front of a grocery store selling Thin Mints). 3b. So please don’t tell us what your spouse thinks. If there’s one thing that really gets under our skin, this is it… “I showed the design to my ‘insert relationship here’ and they said didn’t like it.” First off, while this person is probably super smart and amazing, the designs are based off of your direction, because you know your business and your clients best, not your spouse (unless this person is a business partner, in which case, their input should have been considered from the beginning). This person has not been privy to all the conversations we’ve had leading up to the design and this is likely their first time to hear about the project, so honestly, their opinion is not really relevant to the project. One caveat: if this person brings up actual relevant feedback or questions to you and you agree, feel free to pass those along to us, but please just pass them off as your own thoughts and opinions and don’t pawn it off on your hubby or your kindergartner. 4. That person who created that thing for you a long time ago was not an actual designer. Sometimes clients have a previous experience with a “graphic designer,” (read: someone with a bootleg copy of Photoshop), and their expectations were shattered somewhere along the way, so they’re feeling understandably hesitant to work with a designer again. But a professional graphic designer spends years learning software programs, typefaces, color theory, marketing strategy, and how to decode people’s feelings and turn those feelings into visual imagery. If the only file types you were provided with at the end of the project were jpgs with white backgrounds, that is a tell-tale sign you worked with someone masquerading as a designer. In that case, you have every reason to feel salty about the experience, but please know this probably-well-intentioned person was simply a novice at best, and you should have a completely different experience working with a professional. Now if you were provided files embedded inside a Word document, on the other hand, this person was a monster and you were lucky to escape (a little designer humor). This is what we do for a living and we LOVE it, but we take our craft seriously and we also have bills to pay like everyone else. We charge by the hour, just like an attorney, for our time and expertise, so don’t ask us to give up 1-2 billable hours to dispense that advice for free in exchange for a coffee or a salad (or even worse, “exposure”). Close friends and family are the most common offenders here, not typically a new contact, as this is a more informal “ask.” We love you, so if you want to have coffee and talk about your super cute kids, your stressful mother-in-law, or your new puppy, we’re all in, but if you want to talk shop, offer to pay us for our time first (and you may even be surprised with discounted rate), but don’t make it awkward by expecting it to be free. We’re still seeing a rise in brand identities shedding their initial startup quirkiness and turning toward a more modern, sans-serif version. It might be a little bit boring, but perhaps they’ve just matured… or maybe they are just playing into what they know we all feel comfortable and familiar with. Either way, expect to see more brands rock a clean, modern version as 2019 marches on. Half here… half gone… there’s something intriguing about outlined type, which draws the eye – a smart move for memorable branding! More expressive graphics are popping up all over the web, melding physical & digital landscapes together in an abstract way using photo collages and three-dimensional illustration. While logo designs are continuing to trend toward sameness, we’re seeing more headlines with vintage, abstract, chubby, and nostalgic fonts. An easy way to break up the monotony without going off the deep end is to use various weights of the same font instead. We’re seeing text blocks so large that they break a word or sentence into fragments, which forces you to focus your full attention in order to read each word in it’s entirety – brilliant! ready to update your website in 2019? When Worthington Lawn Care approached us to create a logo for their new business, we were excited to jump right in! At their request, we created concepts that included leaf and tree graphics, and in the end, the leaves were especially appealing because they tie in with the branding of the owners' other companies. We love the pairing of clean, modern slab and sans-serif typefaces for a professional look in their logo, business cards, and shareable social media graphic, all shown below. 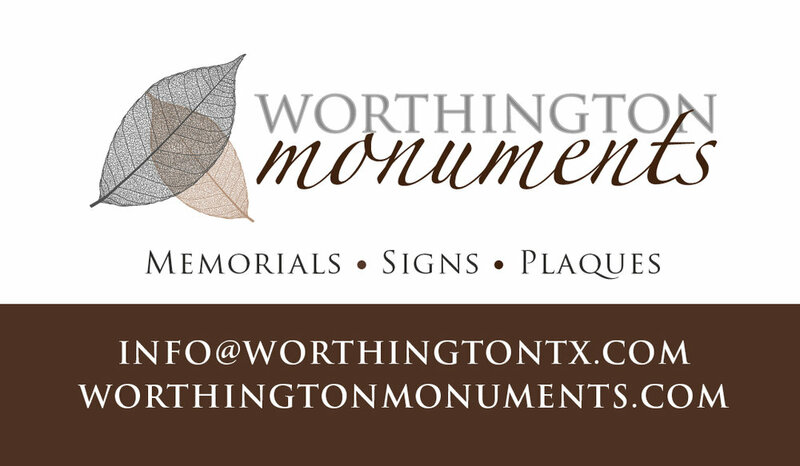 This is not our first time to work with the Worthingtons... we go way back to their first business venture, Worthington Monuments, which has recently grown to include a fifth location in Colleyville, Texas (joining Burleson, Arlington, Stephenville, and Grand Prairie). We recently created a digital email invitation graphic to promote the opening, and updated their letterhead and business cards to include all five locations. Also shown is an ad we designed for placement in an event program where Worthington Monuments was a sponsor. 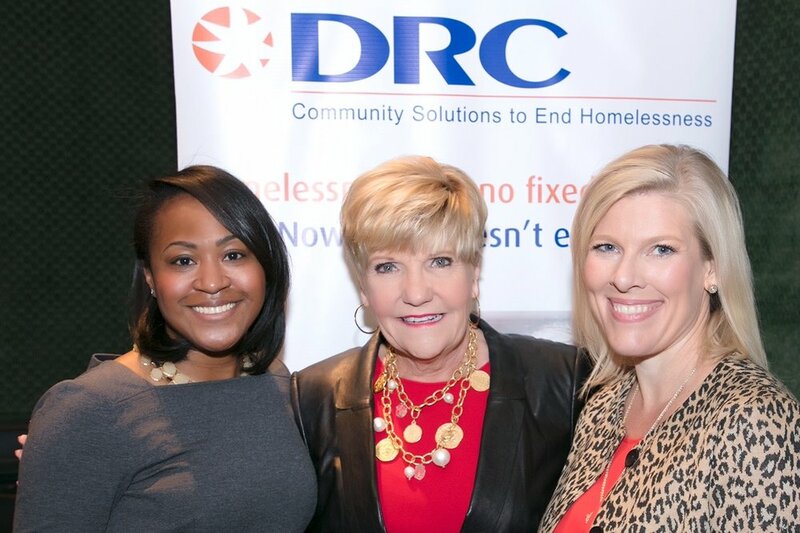 We are so proud when our clients' businesses grow and especially proud of all the work we create for them! I designed my first logo back in journalism school in 2001 if you can believe it. More than 15 years and hundreds of concepts later, I have more than a few logo design tips to share! Color communicates SO much information to us about a business, whether or not we realize it. For this reason, we will typically send the first round of logo proofs in black and white so clients can focus on the design itself instead of being drawn to a design because of its color. Red can actually raise your heart rate, blood pressure, and body temperature, and even make you feel hungry (it’s no secret many fast food and restaurant logos are red)! Yellow may come off as too weak or as cautious; it's also typically too bright to stand on its own and will usually require an accent color as a background or border. Blue is the most common logo color and is generally affiliated with large corporations. Most financial institutions use blue in their branding (because it conveys honesty, trust and integrity, of course). Purple can be polarizing and may come off childish if used incorrectly (though since it appeals to children, you'll notice it often used in toy and candy package design). Black, like brown, can be seen as boring. Keep the fonts crisp and fresh to avoid this. Above all, when planning to brand your business, please don’t choose a color just because it's your favorite color (or worse, your child's favorite color... unless the business is a children's boutique)! Give some serious thought to the core values of your company and determine what color(s) best represent those values. One final (usually-unbreakable) rule: try not to incorporate too many colors in your logo. Instead of multiple colors, try monochromatic shades (using varying tones of only one color). There are plenty of do's and don'ts for pairing complementary fonts, but if there is one cardinal rule, it's to not use too many (1-2 fonts is best, but no more than 3 as a hard rule). Mixing a sans-serif font with a serif font is always nice, or mixing a script font with serif. It's also great to use varied weights of the same font family (for large font families like Helvetica, Garamond, Futura, Myriad, Minion, etc.) Typically, serif fonts evoke tradition, respect, and integrity (ex. Garamond, Times), whereas sans-serif fonts feel modern, high-tech, clean, and simple (ex. Futura, Helvetica, Arial). Your logo isn’t for you, it’s for your customer. When comparing concepts, think about how the logo makes you feel. Do those feelings correspond with the business’ core values? Is there a meaningful story behind the logo? Will the logo stand the test of time or is it trendy (is your business meant to be trendy or are you trying to build clients for life)? Is the logo unique and easily recognizable in a sea of competitors? Does the logo still look great in black and white? Does the logo scale nicely (does look good both super-small and huge)? If not, it might not be a deal-breaker, but you might need a brand mark. We can help! 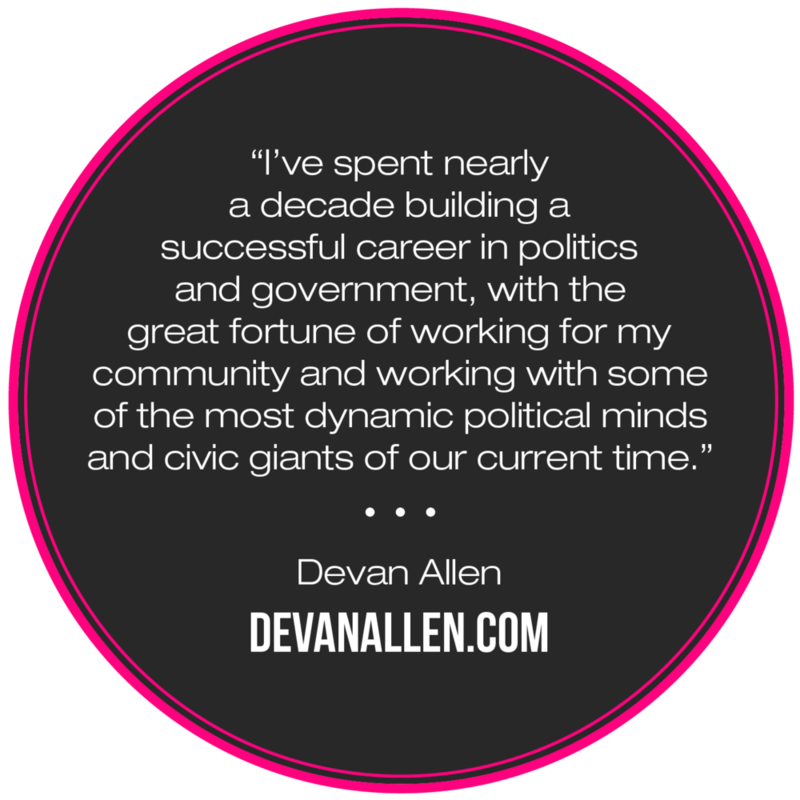 Devan Allen is a successful entrepreneur, speaker, and even political campaign manager, and that's just the tip of the iceberg. 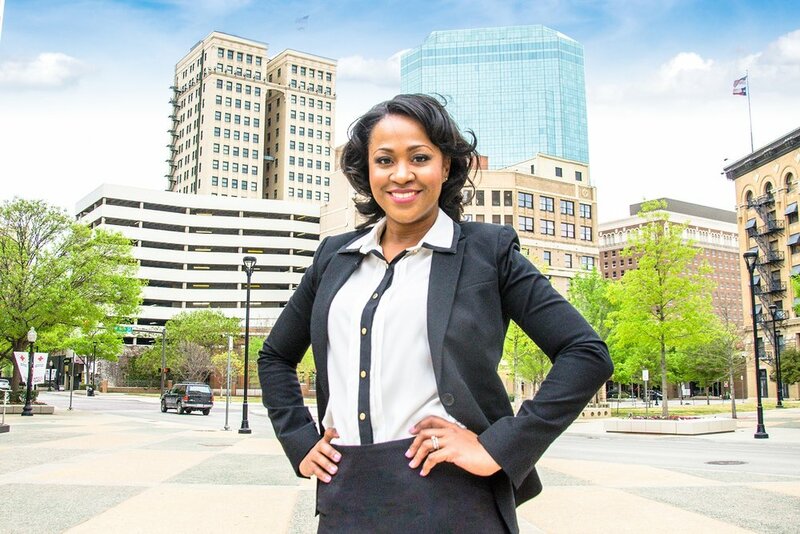 To quote her bio, "Whether developing strategies for high-ranking political leaders, encouraging youth and women to exercise their right to vote, serving as a keynote speaker, or running in a marathon – she uses her work and life experiences to inspire hope and transformation in the community." We're convinced there's nothing she can't do! When I first met Devan, she already had a personal brand and a website, but she'd been wanting to make some changes and wasn't sure how to do them herself. We were able to jump right in and make revisions to her existing Wordpress site, and we've had the pleasure of designing many pieces to promote her endeavors since then. 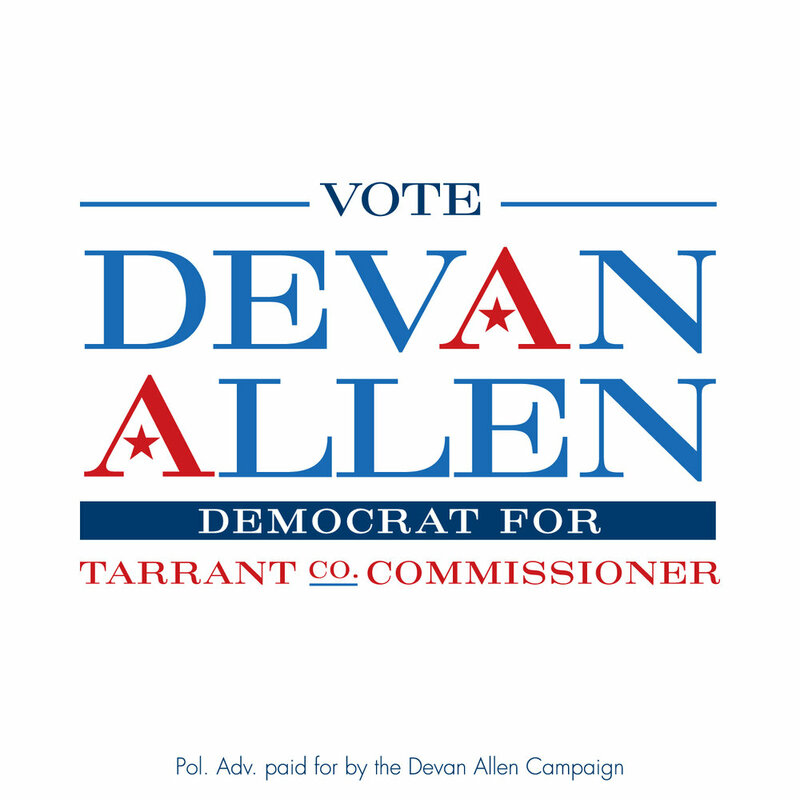 Most recently, we created a logo for her latest venture, Allen Realty Advisors; worked on promotions for the DRC Breakfast with the Mayor, which she co-chaired; and we updated her website again with new text and photos, as well as a fresh, new header image. In addition to Devan's new website header, we're showing off some of the graphics we created for her website and social media, keeping with her existing color palette of black, white, and hot pink. 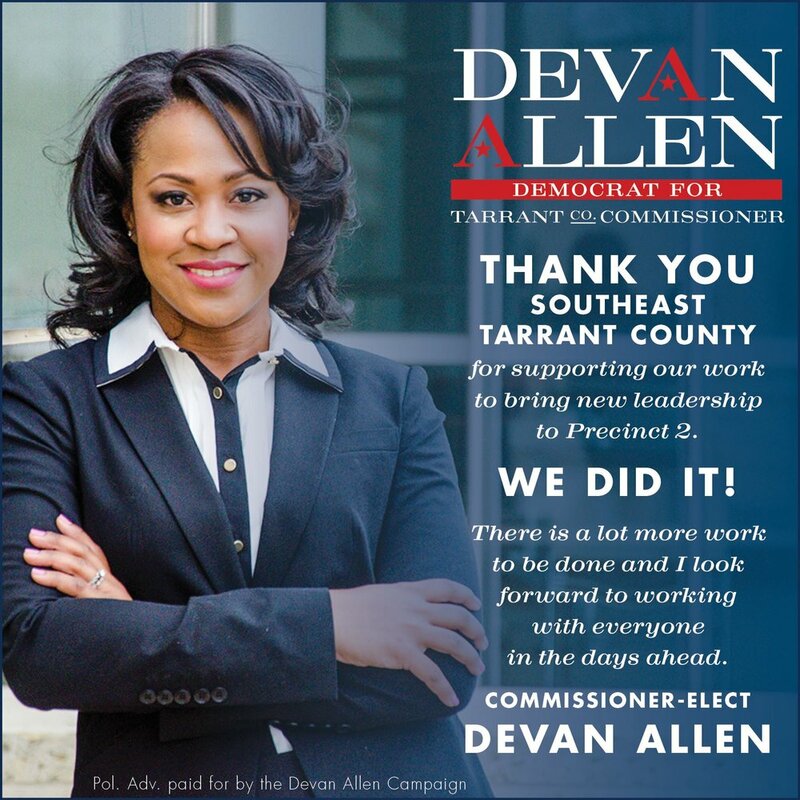 We couldn't agree more with Fort Worth Business CEO magazine – Devan Allen is definitely a woman to watch and we're excited to see what she does next! Please contact us if we can help with your design needs - we love starting from scratch on completely fresh concepts, and we're also happy to revise existing pieces and develop new collateral while conforming to your existing branding! 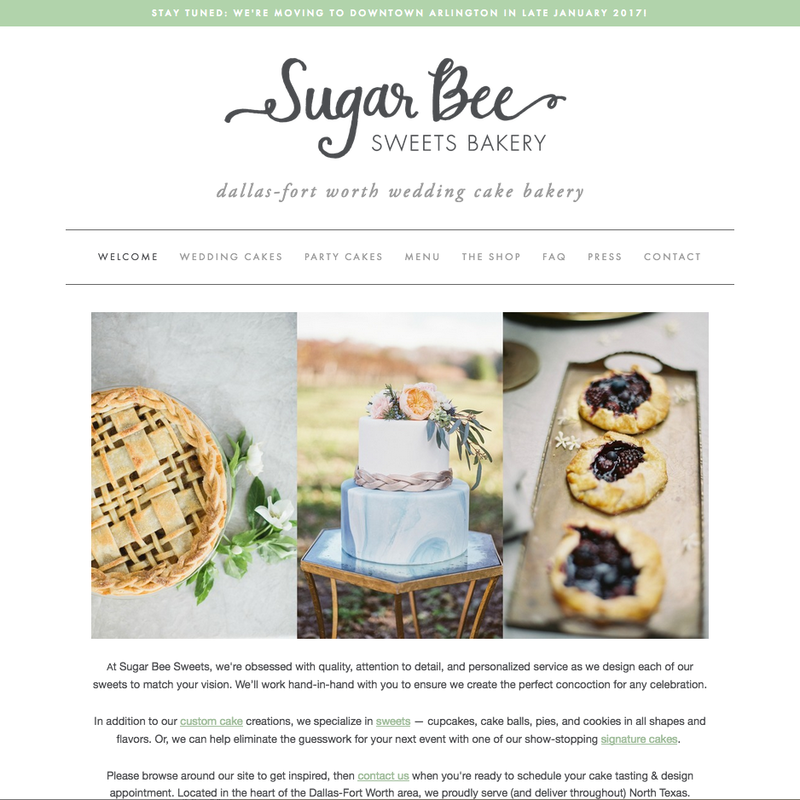 We are proud to have helped evolve the branding, web presence, and printed collateral of Sugar Bee Sweets from day one, when the company consisted of one young woman baking cakes from her home kitchen, to the flourishing business it is today. A favorite among North Texas' most discerning brides and area families alike, Sugar Bee Sweets specializes in couture wedding cakes but also offers all-occasion party cakes and sweets like cupcakes, cake balls, cookies, french macarons, brownies, and more. 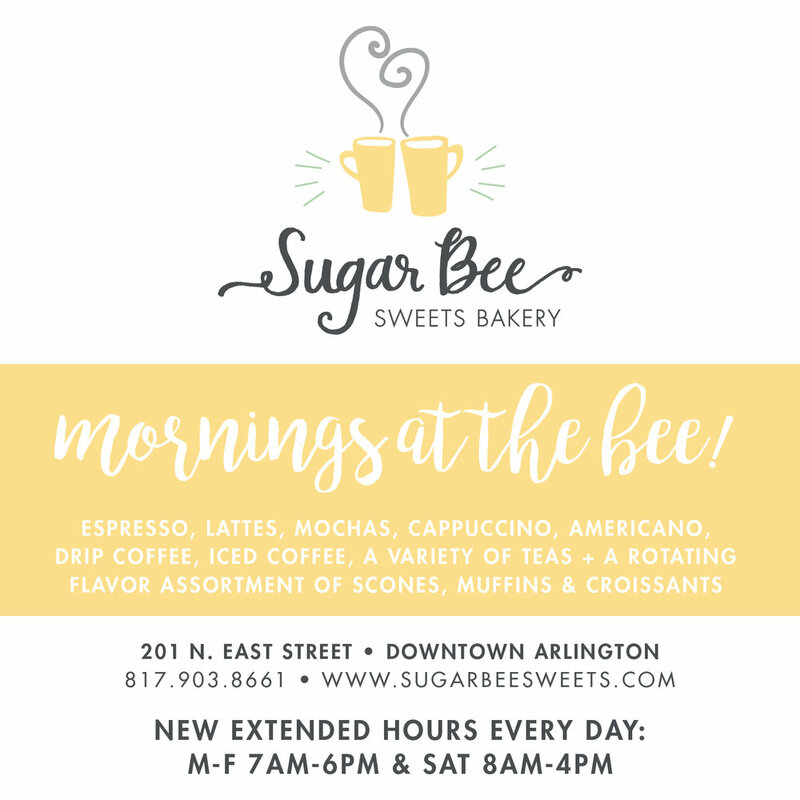 Sugar Bee Sweets' business cards are die-cut hexagon shaped and showcase the logo on one side (with their custom bee) and the back side features all of the bakery's contact information. 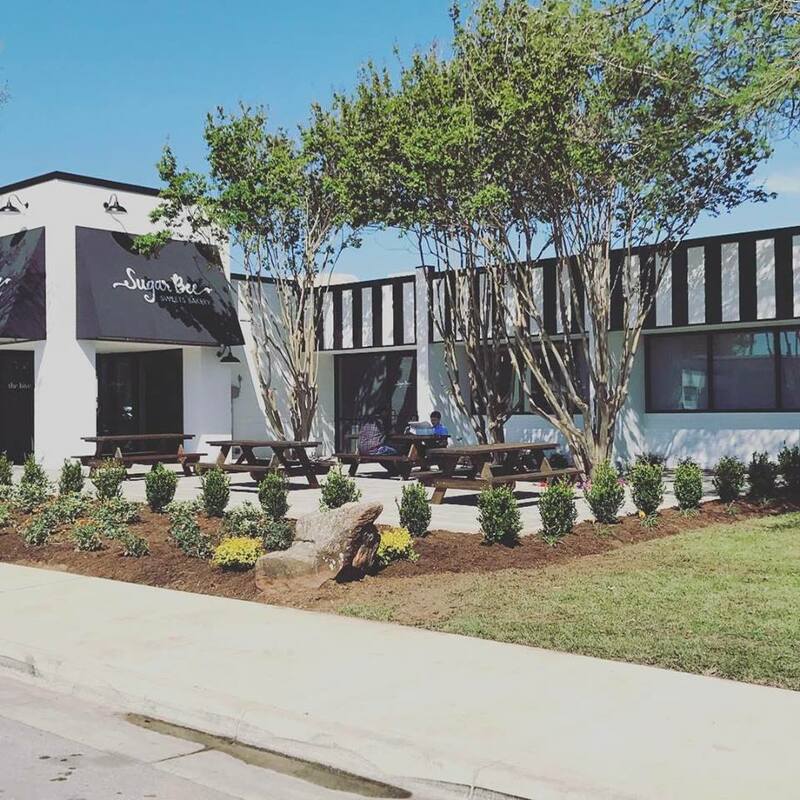 Below is a gallery of some of our favorite work we've designed for Sugar Bee Sweets, including shareable social media graphics, the logo shown on the outside of their new building, hexagon-shaped die-cut business cards, a screenshot of the website, outdoor A-frame signage, print ads for Brides of North Texas and D Weddings magazines, and even the logo recreated on a cookie! We think it's all pretty sweet - let us know what you think!